Frigate (hull classification symbol FFG) is a light capital warship classification in the UNSC Navy. Although they significantly lack the amount of armor, armament, and firepower compared to its larger cousin, the UNSC destroyer, frigates are lighter and more maneuverable. They are also cheaper to produce, allowing greater numbers to be fielded against the Covenant. UNSC Frigates are capable of hovering in an atmosphere and even landing. This ability is displayed by both the UNSC Grafton and the UNSC Saratoga in Halo: Reach and the UNSC Forward Unto Dawn in Halo 3. They also have either a garage or cargo bay in their rear section which is capable of extending out of the ship's ventral side to deploy vehicles or cargo directly to the ground. The UNSC Forward Unto Dawn carried three Pelican dropships in this rear section in addition to several ground vehicles. This is a heavy frigate. It has improved hull armor, two extra single-ship hangars and twelve twin point defense guns, all to make it more effective in ship-to-ship combat and fleet engagements. However, it has a smaller rear hangar (therefor less effective as ground support), and slightly less maneuverability than a light frigate. The UNSC Savannah was a heavy frigate. 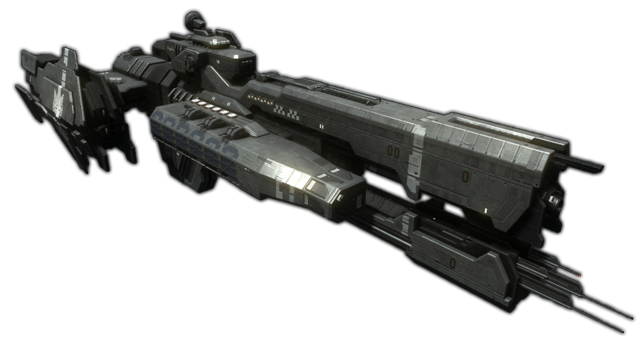 During the Covenant invasion of Reach (Halo: Reach, Halo: The Fall of Reach) it aided in Operation: UPPER CUT to neutralize the Long Night of Solace, a Covenant Supercarrier. Its Shaw-Fujikawa Slipspace drive was removed to be used as a weapon against the carrier, snuck into range aboard a commandeered Covenant corvette, the Ardent Prayer. While attempting to subdue the corvette, the Savannah succumbed to enemy fire and was destroyed while supporting a squadron of UNSC prototype YSS-1000 Sabre starfighters. VEHICLE COMPLEMENT: Above is listed the Heavy Frigate's compliment of smaller craft, be it ships, aircraft or ground vehicles. While the single-ship hangars are self-explanatory (one type of ship per hangar), the rear hangar uses a slot system. Other vehicles count as a number of slots (or half slots) and take up slot space in the rear hangar. Heavy frigates have smaller rear hangars with 24 slots, while light frigates have larger rear hangars with roughly twice the slot space. Rear hangars are meant mostly for ground support and troop/vehicle deployment. CLARION SPY DRONES: These can be launched from the frigate and fly ahead of the ship for reconnaissance. They can use their own sensors to extend the range of the frigate, while being harder to detect due to their size and construction. MAC GUN: The frigate's Magnetic Accelerator Cannon, or MAC Gun, is its main offensive weapon against enemy ships. It has considerable power and damage, but requires time to build up a charge to fire a solid projectile at near-lightspeed. To offset its powerful Damage, it has a Rate of Fire of one shot every three rounds (which also fits the canon material of the HALO setting). CAPITAL MISSILE LAUNCHERS: These weapons listed above have two paylod types, Shiva and Harpoon. Both are types of nuclear warhead missiles, the Shiva being for maximum widespread damage, and the harpoon being more of a lower-powered tactical nuclear weapon. Shivas are always issued in limited numbers (3 for frigates), with Harpoons not much better. ARCHER MISSILE PODS: These are simply starfighter scale missile launcher weapons. They are listed with a Rate of Fire of 1-5, meaning they can launch between 1 to 5 missiles per attack, and potentially make 5 Damage rolls in a single attack. They also list the Special rule Volley-fire (see below). VOLLEY-FIRE: The Archer Missile Pods can fire missiles in concentrated volleys, fire-linking up to 5 missiles in a single attack to do more Damage in a single Damage roll (instead of multiple lesser Damage rolls as stated above). With current human technology, UNSC frigates are barely considered a match for even the smallest of Covenant warships. It is outclassed even by smaller Covenant ships, its armor is susceptible to enemy point-defense pulse lasers and plasma torpedoes, and it is outfitted with substandard weaponry. Only en masse does the UNSC frigate give any UNSC fleet element an advantage against even inferior numbers of Covenant capital ships. Despite this, two Frigates, the UNSC In Amber Clad and the UNSC Forward Unto Dawn played a crucial role in winning the Human-Covenant war, acting as the human flagships in the Battle of Installation 05 and the Battle of Installation 00, although both ended up destroyed. The frigate's speed and maneuvering advantage, however, allow UNSC frigates to provide fire support to other UNSC fighter craft such as Sabres or Longswords and engage both multiple enemy single ship fighters like Banshee interceptors or Seraphs and light enemy warships simultaneously; its speed allows it to put down fire on an enemy ship while being able to avoid a large amount of fire from largely superior Covenant weaponry. The bridge of the frigate is located in the uppermost part of the ship, in the section at the stern-most tip of the MAC gun shaft. The commanding officer's chair is located behind the two primary consoles within the bridge. There also are numerous other consoles located at the sides of the room. There are four bridge stations: Navigation, Operations, Weapons, and Communications. There are universal docking rings on both sides on the bridge. On top of the bridge is a maser dish for short-range communication. The forward midsection of the ship has numerous single ship hangar bays for Pelicans or fighter craft like Longswords on both sides. A UNSC frigate also possess 12 SOEIV bays, located in the rear of the ship, which facilitate the deployment of Orbital Drop Shock Troopers (ODSTs). 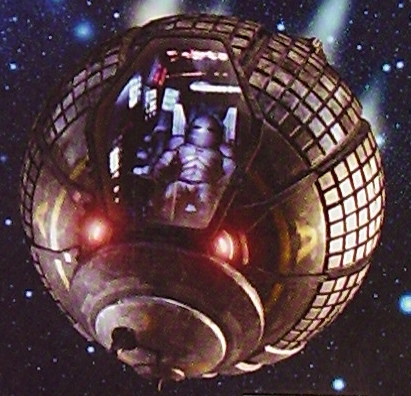 Also, spread throughout the frigate's structure are a number of its many escape pod bays. They also have a large loading elevator in their rear section which is capable of extending out of the ship's ventral side to deploy vehicles or cargo directly to the ground. The UNSC Forward Unto Dawn featured a large rear section which had the capacity of holding several Pelicans in addition to numerous ground vehicles. These hangar floor elevators have been seen operating in two different modes; the single-sided hinges on the elevator are able to swing down 90? in order to allow aircraft like Pelicans to drop vertically out of the hangar for quick deployment. So far the frigate is the only UNSC warship that has been seen landing and deploying vehicles directly to the surface of a planet (or Halo installation in the Dawn's case). There are a number of different variants of the UNSC frigate; two named ones being the light frigate and heavy frigate. The heavy frigate boasts additional Titanium-A armor plating and a larger number of point-defense guns than standard frigates. Another major difference that has been observed between regular UNSC frigates and heavy frigates is the size of the main hangar on the underside of the vessel. This may indicate a difference in roles between normal and heavy frigates; as heavy frigates tend to have more armaments and armor but lack larger hangars may indicate that they are designed more for close support roles in space and in atmosphere, while normal frigates may not engage in direct ship-to-ship combat, rather they deploy and supply UNSC ground forces as opposed to directly providing close fire support. A typical frigate of 2552 may have a length of 478 metres (1,570 ft) (In Amber Clad variant) or 489.7 metres (1,607 ft) (Forward Unto Dawn variant) with a width of 151.9 metres (498 ft) and a height of 112.3 metres (368 ft). Like other human ships, the UNSC frigate is powered by thermonuclear fusion reactors which use deuterium (a stable hydrogen isotope) as fuel. The engines almost certainly use the energy obtained from this process to heat some form of reaction propellant which is expelled out of rear-facing exhausts to generate thrust. There are four exhausts visible on frigates; two large and two small. In addition, the frigate has two sets of forward maneuvering thrusters near the front. For interstellar voyages, the frigate carries a Shaw-Fujikawa Translight Engine. Although they cannot be seen, it can be safely assumed that frigates also possess multiple maneuvering thrusters to adjust a vessel's attitude in three dimensions. Finally, UNSC frigates are capable of hovering in an atmosphere and even landing. This is likely accomplished through the use of anti-gravity generators, although the technology involved has never been elaborated upon. They have several times been observed to hover in an atmosphere. It is possible that they vector thrust downward in order to accomplish this feat, but no downward-pointing exhaust nozzles are visible. It is also possible that they employ some form of Covenant-derived antigravity mechanism, or perhaps electrostatic or magnetic levitation. -1 Magnetic Accelerator Cannon which is able to fire one round per charge. The MAC runs between one- and two-thirds of a Frigate's total length. -3 Shiva-class Nuclear Missiles serve as heavy ordnance. -40 Archer missile pods which carry around thirty missiles per pod, adding up to a total of 1200 missiles. -4-12 50mm point defense guns function as the last line of defense against single ships and incoming missiles, with the ability to later retract into the vessel. They are used for aerial bombardment on occasion. The amount of guns possesed on each ship varies by variant of frigate. -(Optional) 5-10 Twin Defensive Rail Gun Turrets. These guns can replace the 50mm Point Defense Guns for some variants of the frigate. The UNSC Aegis Fate is believed to have had these weapons. No precise figures are available regarding the crew of a frigate, although numbers have been speculated. Like larger ships, a detachment of Marines and possibly ODSTs would be present onboard. The crew number includes deck crews as well as the command crew, Marines, ODSTs, dropship pilots, and technical personnel. The number of personnel a single frigate is capable of housing numbers at least within the thousands. Since many frigates have been seen in ground support roles, it is likely that the complement of Marine and ODST personnel on board is higher in percentage than other ships that are more dedicated to space combat. In 2552 Sergeant Major Avery Johnson was supposedly able to single-handedly control the frigate UNSC Forward Unto Dawn to aid SPARTAN John-117 and Arbiter Thel 'Vadam on the newly rebuilt Halo, though an auto-pilot function was available with the use of the ship's onboard navigational computer. 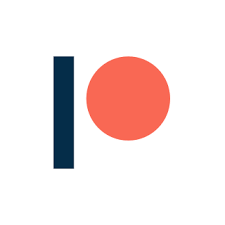 An AI can monitor and regulate all critical functions without human intervention. The armor of a frigate is relatively poor compared to that of its larger cousins and counterparts such as the UNSC destroyer, with only 60cm of titanium-A battle plate. However, due to its relatively light weight, the frigate's strength lies instead in maneuverability and speed. The frigate's relatively wide design is supported by structural support ribs, allowing it to perform orbital incursions. -The frigate's hangar is about the width of a Sabre in its Halo: Reach rendition, approximately half the size of its Halo 3 version. -The frigate's hangar is also much longer in its Halo: Reach version. -The frigates in Halo 3 have only four point defense turrets while in Halo: Reach they have twelve. -The frigates in Halo: Reach have a similar hangar size to the frigates in Halo 2. -From Halo 2 to Halo: Reach, the frigates have a noticeable difference. The frigates in Halo 2 seem to have a more bigger "bump" on the front of the frigate, near the MAC gun. -In Halo 3, it is possible for the frigate to release its hangar bay doors.